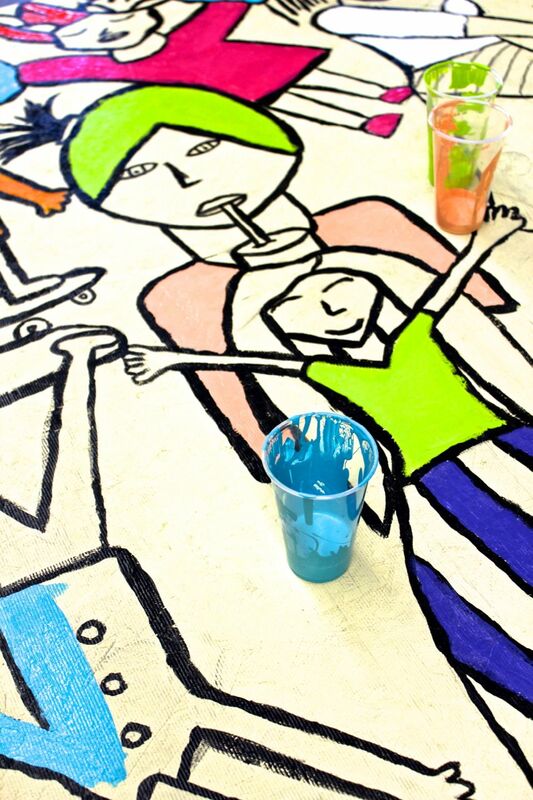 Excited to share a peek into our mural making process, creating with 118 youth, start to finish! To encompass a wide array of ideas and interests, we began with a HUGE brainstorm of all the things young people LOVE to do. 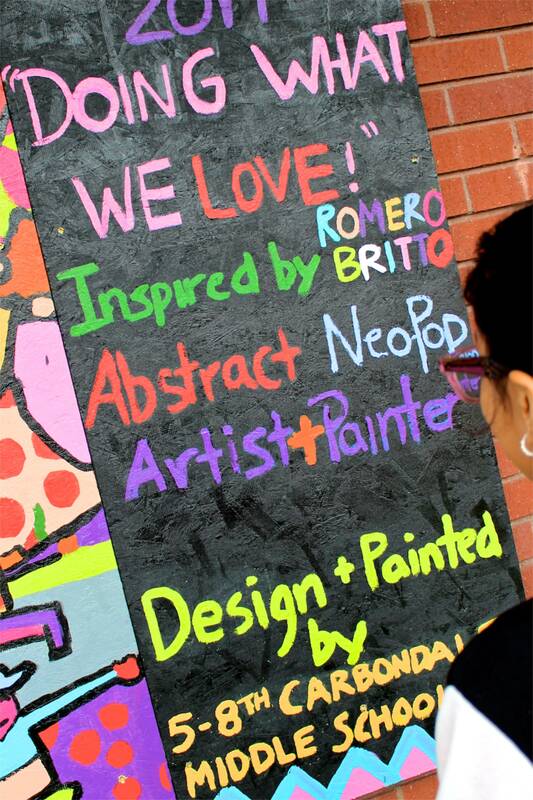 We chose Neo-pop artist, Romero Britto, as our “in the style of artist” for his colorful, vibrant, happy, positive, abstract and energetic style! Each artist involved (10-14 years of age) sketched three or more figures doing activities youth LOVE to do. Many of the sketches included activities and hobbies they personally cherished! Ideas ranged from biking to climbing, dancing to singing, reading to exploring, skiing to snowboarding, eating ice-cream to licking lollipops just to name a few, the brainstorm was bursting! Using the majority of these AMAZING black and white drawings, proportional mini-models were created, arranged and organized, to create scaled versions of the final mural boards. A scaled model was created in black and white to guide each of the eight individualized murals. The grid method was used to enlarge the overall plan onto each primed board. Drawings were penciled, then sharpied and then painted using black exterior paint. When it came to paint, we used semi-gloss, exterior, low VOC paint, purchased at a local hardware store that was very easy to cleanup, yet guaranteed long lasting results for years to come! 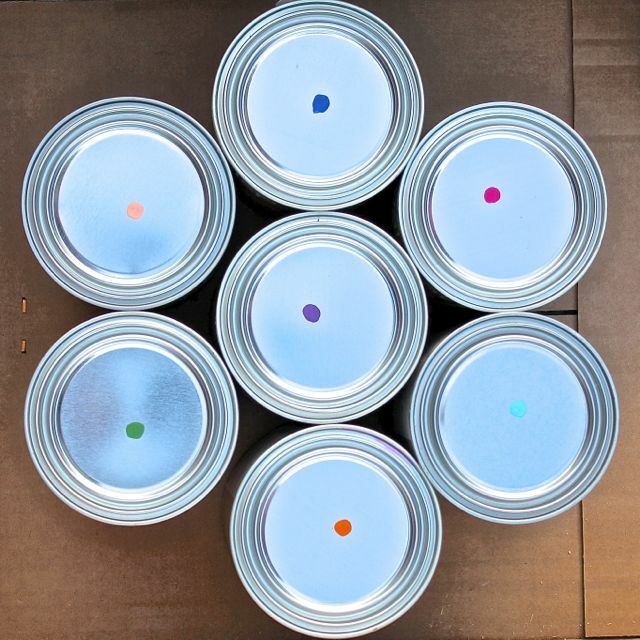 A peek at our vibrant paint table as we were moving onto color! With a chosen color pallet, each artist made their own selection of color as they worked to create a beautiful + unified color pallet, while working to balance + represent a wide array of color. 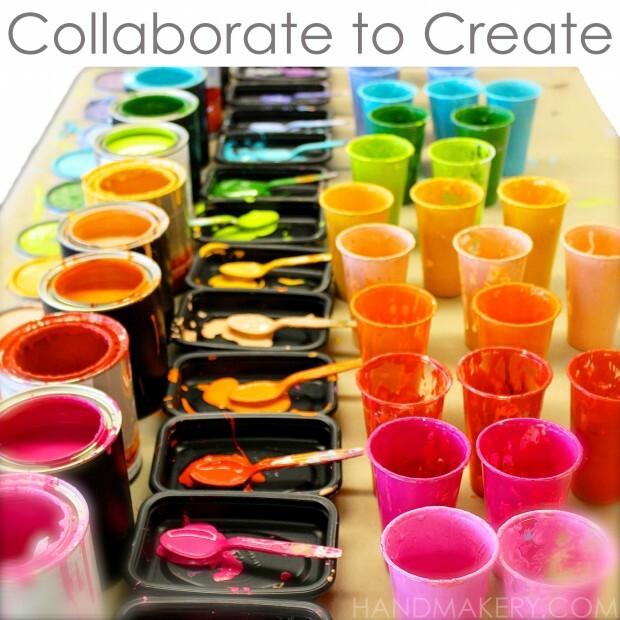 With having so many beautiful colors we stayed with pure color, rather than color mixing. With so many youth working on this project, having an organized supply location was key! 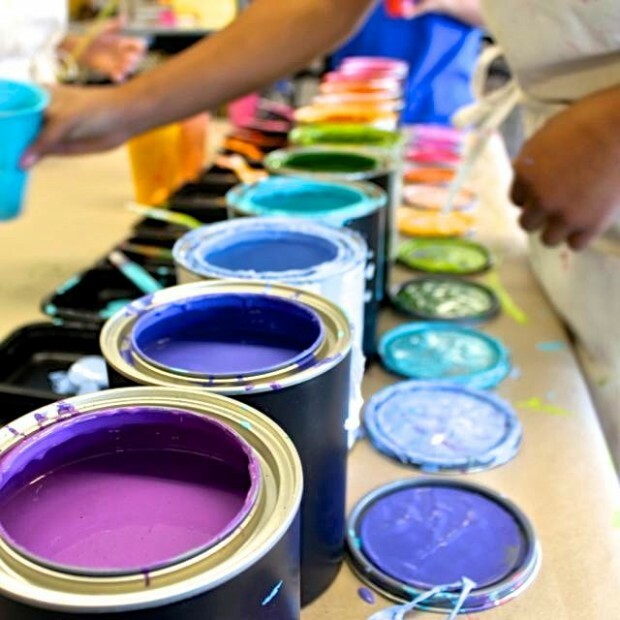 Spoons + cups were able to be reused each day and paint could easily be poured back into cans to conserve resources. Daily, it was truly amazing to be part of a room full of 25+/- youth in such organized and creative chaos, completely productive and involved in the creative process and experience! A glimpse of color just getting underway, plus the contrast of vivid + varied black line! A favorite photo of an artist caught in the moment, just before cleanup! Amazed at how beautiful the colors were captured in her hand! Let the color unfold. 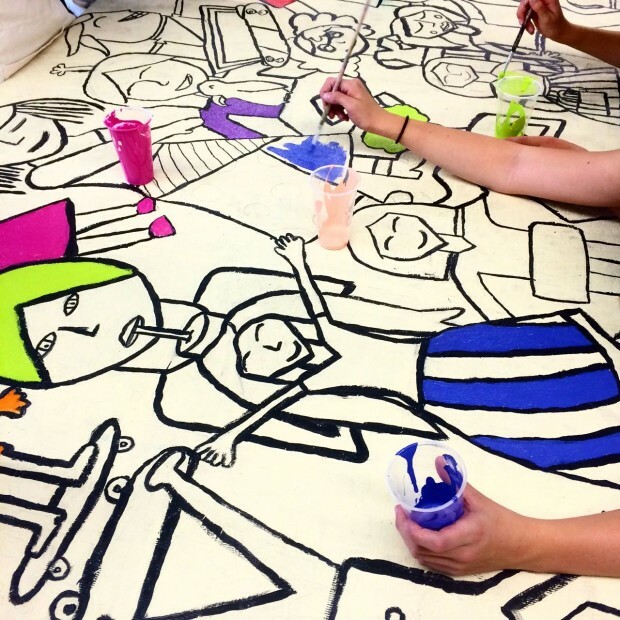 In the process of a mural, you have a general outline of where you’ve started and where you are going, but there is pure beauty and joy in what naturally unfolds and the exciting unknown that lies ahead. There were days were the paint table reminded us of an ice-cream shop! Who wouldn’t want to eat up this color? With a mural there is so much anticipation. The process brings so much mystery + wonder, you have the general game plan but the way it unfolds and blooms is magical! Moving into pattern we discovered each of Romero Britto’s shapes always had one pattern composed of two colors, to keep his work united + simple! Together we looked at some of Britto’s favorite patterns to incorporate, yet also created new patterns of our own! 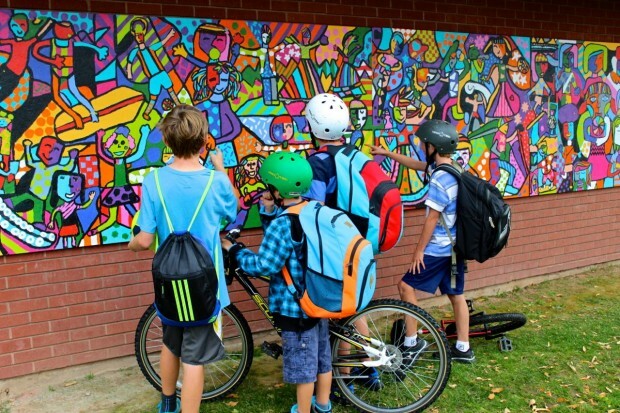 This addition really brought the mural to life and gave each artist an opportunity to personalize space with color and design! 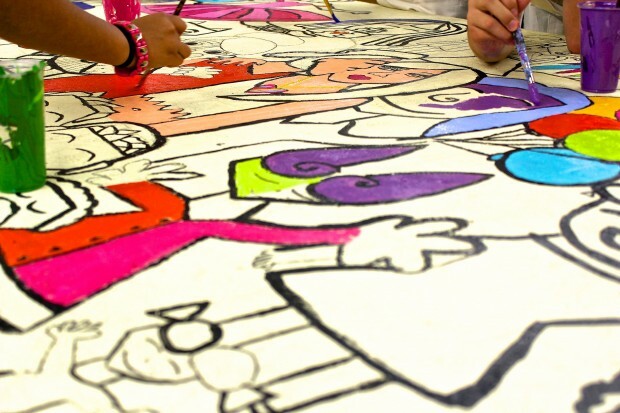 Love this capture of the continuous teamwork that this mural brought daily, it was truly a “collaborate to create” project! 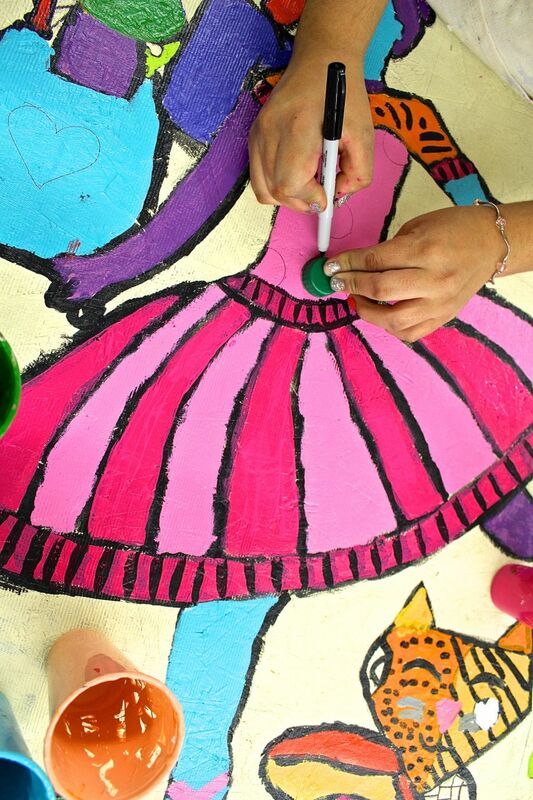 A close-up capture of a section drawn and painted by the oldest group participating in our project! Love the details and expression put into this face! All hands-on, detailing with black to really pop the figures and to create definition! All hands on deck. This was the first day that all eight segments were brought together into the studio to view as a whole. Before this day, we only had two mural pieces in the studio at a time! Bringing all mural pieces together for touch up was such an exciting event, to see it all come together was magical as it filled the room with such positive and creative energy and excitement! It is alway a great thing when your husband is willing to take on and complete another mural install, I’m thankful daily! 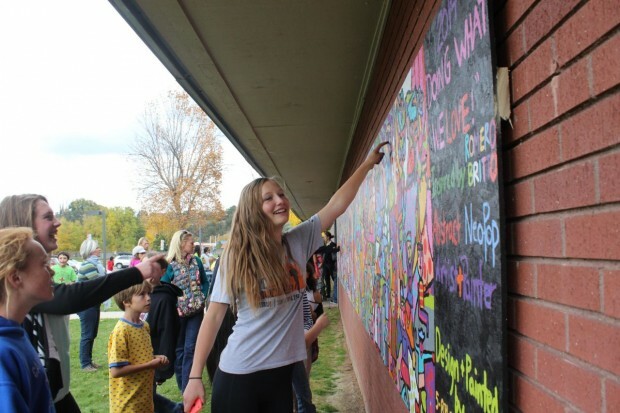 A fabulous school + community turnout for our mid-day, late-October, mural unveiling ceremony. The 62 foot mural was all covered, so there was great anticipation by all those gathered! So thankful and appreciative to everyone that joined us for this special and memorable day (very thankful too, that the weather held out when rain was just above)! The ribbon cutting, just before the count down, 10 – 9 – 8 – 7 – 6 – 5 – 4 – 3 – 2 – 1, that led to the start of the student led unveiling! It was incredible watching the mural go from pure black and all covered, to a stage of curtains opening inside to out, unveiling a colorful + hidden treasure for so many to enjoy! The reactions of the children and adults present was such a highlight and worth every minute invested on this piece! To only be able to replay it, over and over again! Excitement and surprise when the mural was first unveiled! 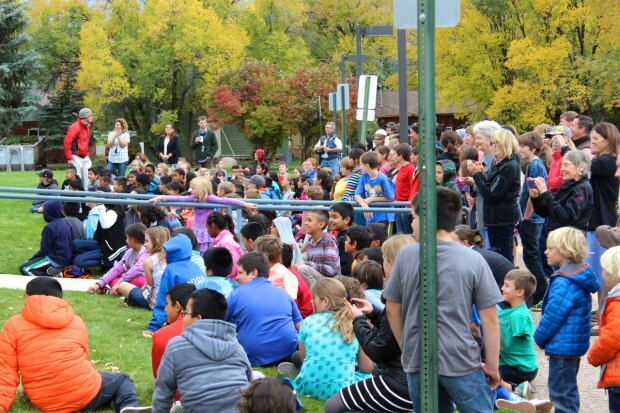 Our very own local newspaper, The Sopris Sun, joined us to celebrate! Photo credit above: Editor Lynn Burton, The Sopris Sun. A collection of photos of the mural below: DOING WHAT WE LOVE! 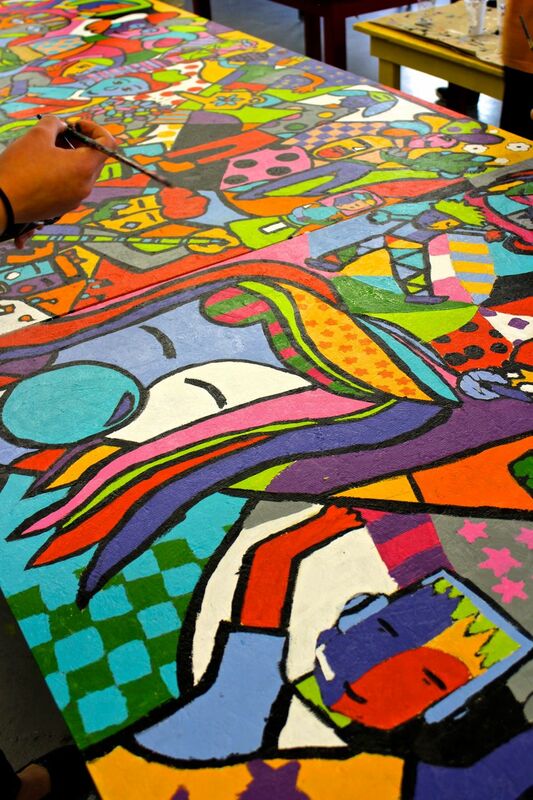 Inspired by Romero Britto. Abstract + Neo-Pop + Artist + Painter. Designed + Painted by 5-8th Grade Youth! Individual closeups of all eight mural boards (since a 62′ horizontal photo is a bit hard to capture)! So proud of the investment, dedication, involvement, determination, commitment + creativity that each of these youth invested from start to finish on this piece! 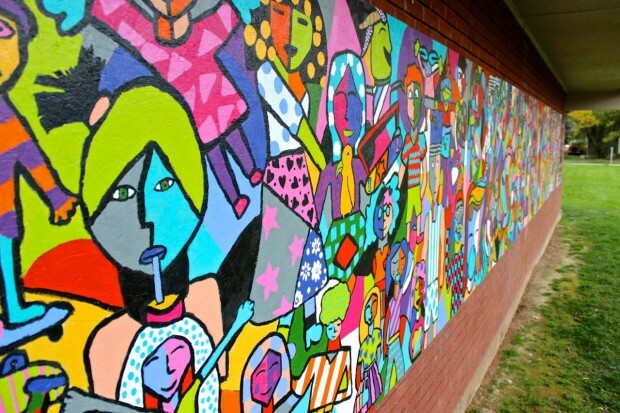 My heart was touched when a teacher + friend of mine shared: “I like to pull up (to school), sit in my car and study the mural for five minutes before starting my day. 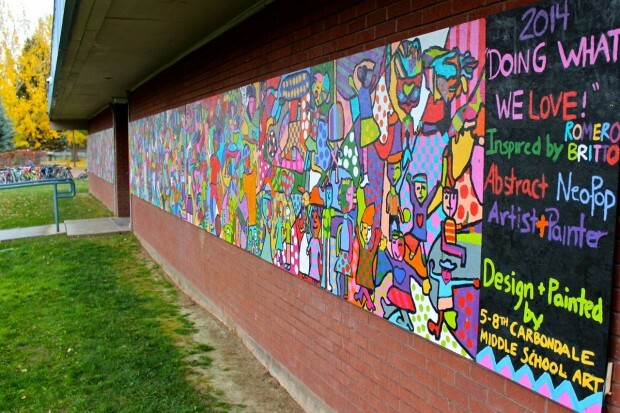 The mural is so inspirational and beautiful, the perfect daily reminder of why I am here!” The mural across the front of the school has created a new energy + beauty + message, on the traditional brick building. There is now an AWESOME + CREATIVE + POSITIVE ENERGY that touches everyone that passes by or enters into the school! 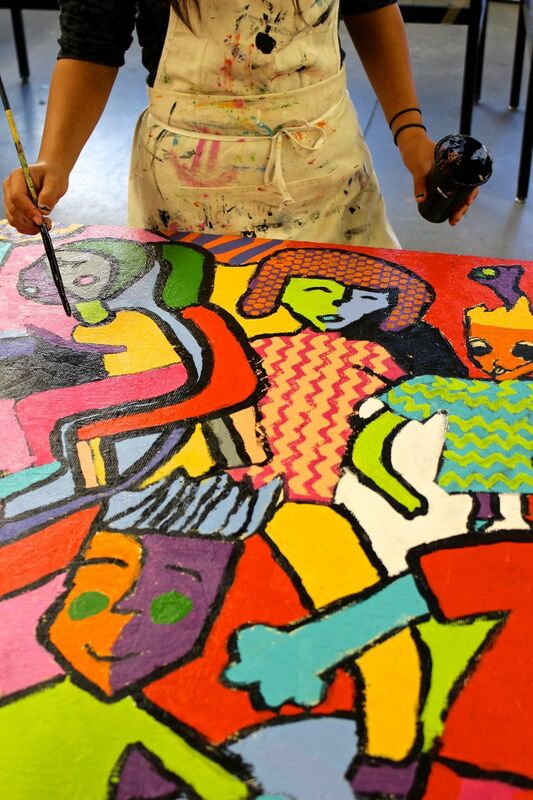 You can feel the energy + passion + dedication + excitement + creativity + love that each child put in to this piece! THE POWER OF: coming together to create, communicating visually, child as artist, community collaboration, transforming old spaces into new places! 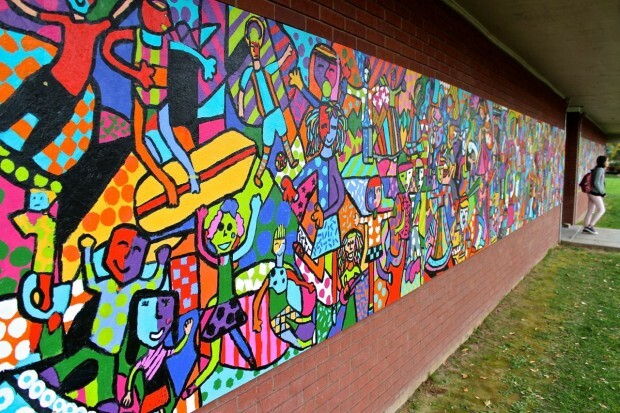 A “distance capture” of the entire mural project all together, it takes on a colorful + mosaic-like feel! Absolutely LOVE how the mural made the building feel so much more kid-friendly and welcoming! 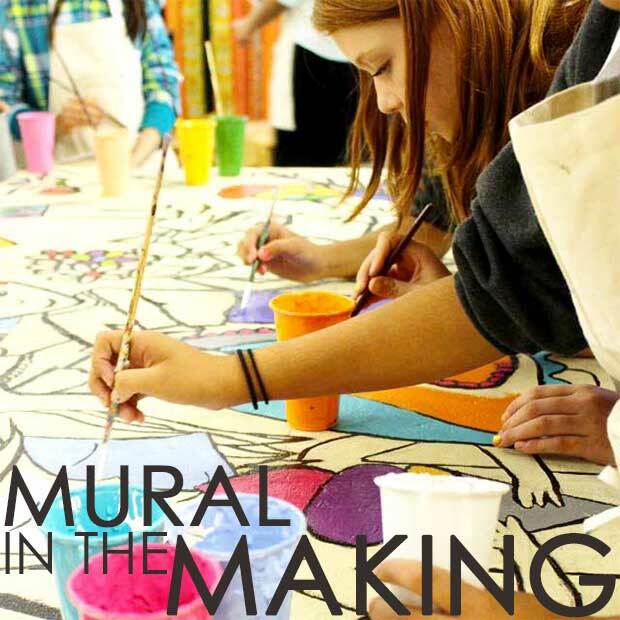 Have you taken a peek at our mural SEASONS, capturing spring to summer to fall to winter also created by youth? This piece, which is half the size of our mural DOING WHAT WE LOVE, is located in Historic Downtown Carbondale across from the Village Smithy on 3rd + Main Street actually on another historic + beautiful + brick building! Both murals are in town, be sure to stop by and take a peek! This is insane. I mean, I’ve come back to your site like three times just to stare. This is AMAZING!!! Wow, bravo to all the kids that participated and all the adults that supported them through this incredible process. Really, it’s unbelievable work. I have so many questions too. For starters, what are the mural boards? Just wood? Did you prime it? Did you study the style of the artist a lot before drawing the pics? They’re so cool. I’d love more info on how you got the drawings to the boards. Email me if it’s easier! I NEED TO KNOW. Just in love with this. Congratulations! Hello Meri! I know I emailed you all the juicy details about this mural projects but also wanted to answer your questions for this post! First of all, thank you so much for taking the time to checkout our post- MURAL IN THE MAKING! I was the only adult with my 118 artists, so this process is completely doable for anyone wanting to jump in and if you have even more adults on board, all the better! It’s really about the organized process and getting each child connected and celebrated. The mural boards were full sheets of plywood that was specifically for the outdoors. Yes, we did prime the front, back and sides of each board to protect the wood from the elements. Our display location was also selected carefully to a covered areas that didn’t get much sun or rain exposure. This is my third giant mural for our community and over the years, even with high quality + outdoor + high gloss paint, over the years the colors can lose their brilliance if they’re directly in the intense elements over long span of time! Yes, we did study our featured artist in-depth and really made a list of features that really captured the style of our artist. There was lots of brainstorming + sketching that took place! We created a mini, black and white, paper mural, that was in proportion to each of our mural boards, with all the sketches that were selected. This paper version was gridded, and the actual wood boards were also gridded, so students could understand placement and visual orientation as to where each figure should be placed. Just to clarify, the 118 students worked within classes of approximately 20-25 students. Each class of 20-25 students were then divided into different groups focusing on a board, so our groups were smaller, allowing each group to really take leadership and responsibility for their board contribution to the whole! Thanks so much for the encouragement Meri!!! It was so fun to see it come together and to have our unveiling ceremony!!! Absolutely stunning! I love the inspiration the process and the results. You should be amazingly proud of your artists! This is an experience they won’t forget! 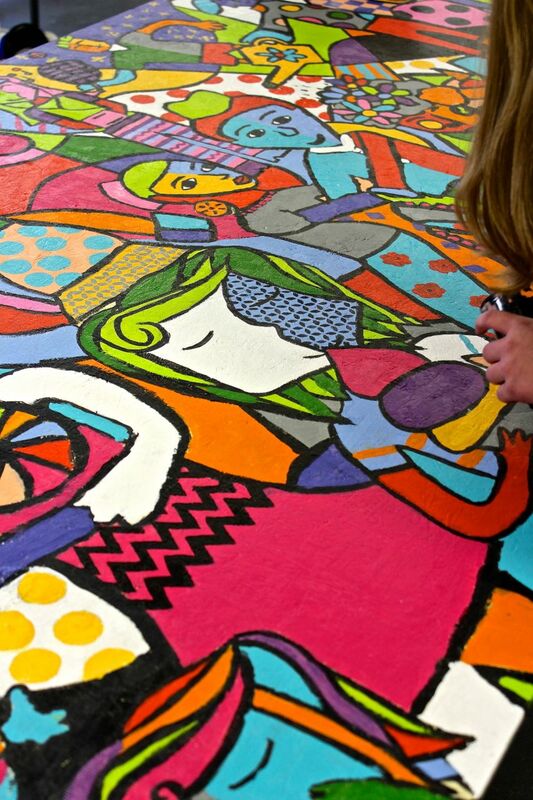 Thank you so much Ana for taking a peek at our giant mural making process! I think I was reminded of your amazing GIANT CLAY BEAD post and what you said about switching up the size and super-sizing projects!!! This was probably the most gigantic piece of art that I’ve had my hand in at 62 feet! 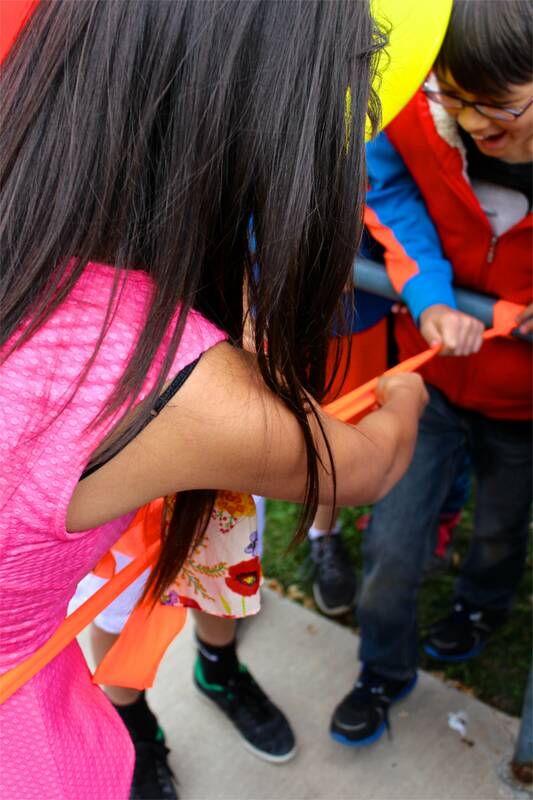 I truly love creating something as a team with children, based on their ideas and inspiration! Children love creating as a community of artists and seeing their ideas and creative endeavors become public + permanent art! They love the idea that so many people will see their work, I think it’s a feeling of being showcased and feeling famous (especially at this age)! Each child was proud of their involvement in the process from brainstorming, sketching, drawing, designing, painting and working as a team! 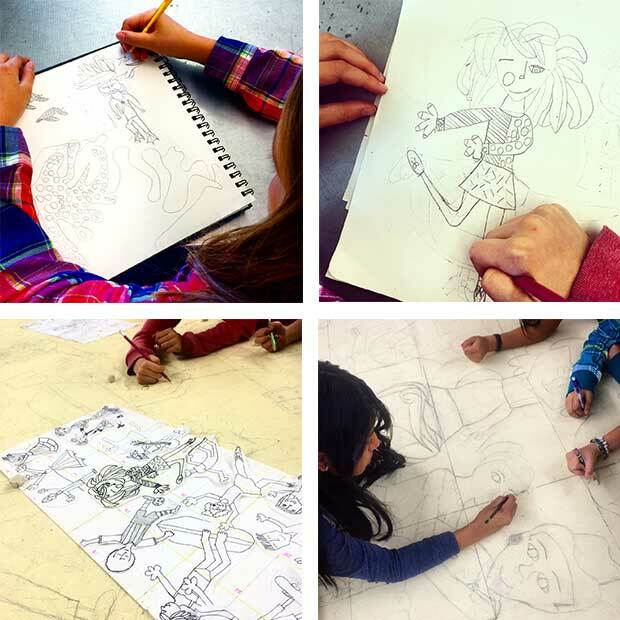 I really treasured that it pushed art making to a collaborative level for these kids! Like you said, I really hope it’s an experience they’ll never forget! I know thinking back to the process puts a smile on my face! This is absolutely amazing and seriously brings the brightest smile to my face! I can only imagine the huge amount creative confidence and pride you’ve helped grow in these students! Thank you so much Chelsey for taking a peek at our MURAL IN THE MAKING project! So appreciate it! I love seeing children come together to create an awesome piece of art together and they usually love working as a team of artists! There is so much learned coming together with a group of individuals and working as a group to accomplish a piece to the puzzle! As an art instructor, confidence and feeling proud are probably two of the most important elements developed in creating art, especially at the middle school age, so thank you for recognizing those element!!! 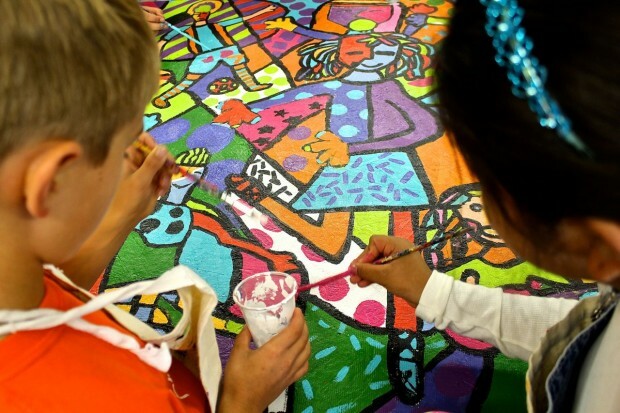 It’s amazing how children grow so much as individuals, coming together through creating art! Thanks Chelsey!!! Okay, I’m blown away by this, too! It’s amazing- and HUGE! It just looks so beautiful up and all together on the wall. I have the same questions Meri does, and did you seal it with anything? How fun this would be to do with one of my kids’ classes! Thank you Jeanette! I answered most of Meri’s questions via email but also just responded on the blog! With the paint being high gloss exterior the hardware store said we should be good to go without sealing! We also put it in a shady + protected from the elements location, just to help preserve longterm, but this isn’t always needed. We’ve done two other murals similar within our community, it’s pretty amazing how good they still look even being completely exposed. You may have seen our SEASONS mural at the bottom and this had no protection above and was on a completely exposed brick wall. The paint these days is pretty amazing!!! YES!! 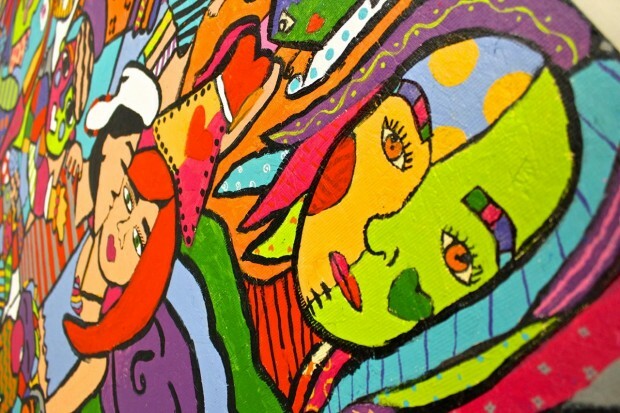 !…would LOVE to see you take a mural project on with your kids!!! They’re so much fun and the themes + color schemes are endless! Keep me posted if you decide! Thank you Kate for checking out our mural project! The unveiling was pretty amazing! It was behind black plastic and I think most people had no idea of the color explosion coming their way!!! This is incredibly beautiful…what a fabulous entrance piece for your school. I love it! Am going to share it with all my teacher friends here in Perth, Western Australia and hopefully. maybe, one of them will take it on board and do their school as proud as your’s should be. Congratulations to all the young artists who participated in creating this wonderful tribute to their talents! Thanks for making me smile with joy. Thank you Carol! So happy you found our blog! Thank you for spreading the word to your co-workers! I truly hope a teacher in your school wwill be interested in creating a piece for your school! We are enjoying this piece on the front of our school! 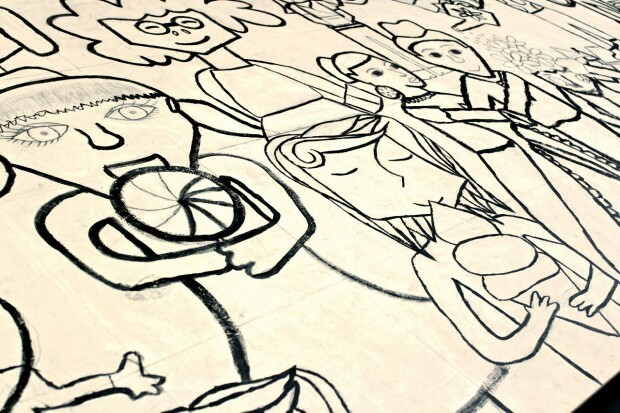 This piece was created with 5th-8th so it was exciting to see it come together with the different age groups! Thank you so much for your message today! I’m always amazed at anyone that teaches kinder! My daughter started last week! I remember so much about my kindergarten days! We are lucky to have teachers like you, so good with the littles!!! Bar- Thank you so much for checking out the Mural in the Making post! Thank you for your encouragement + compliments! It was a pretty big production but with having a main paint table organized by color + a location we could store the boards, the studio stayed streamlined! I loved doing big murals, this is actually number three for our community. Once you have it down, they’re really easy to manage and pretty affordable (boards + paint)…it’s really more of selecting an engaging theme that can get so many kids involved and connected. The artists really need to like what’s being communicated. 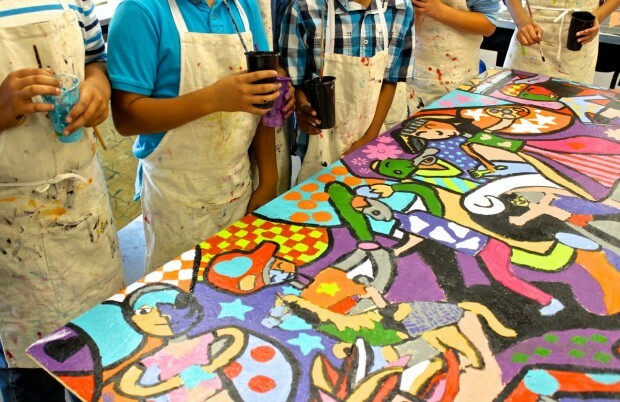 Romero Britto’s style is so expressive and abstract that this age group didn’t feel intimidated at jumping ALL in. It’s always so fun to see where you land, from where you started. Watching them was magical, they had the routine so dialed in. I came across a great Alisa Burke mural video last week and was again inspired to tackle another one, but maybe down the road. We’ll see! I also dream of being neighbors with you, you are one of my biggest inspirations + idols… you have the magic touch Bar and such a vision to the whole! I admire your project ideas and how you stay so true to your curated presence! If I could only jump in your graphic design online course!!! Hint, hint!!! I’d promise to the first signed up student!!! You’d be so amazing! Have you ever thought of leaping into adult workshops!?! 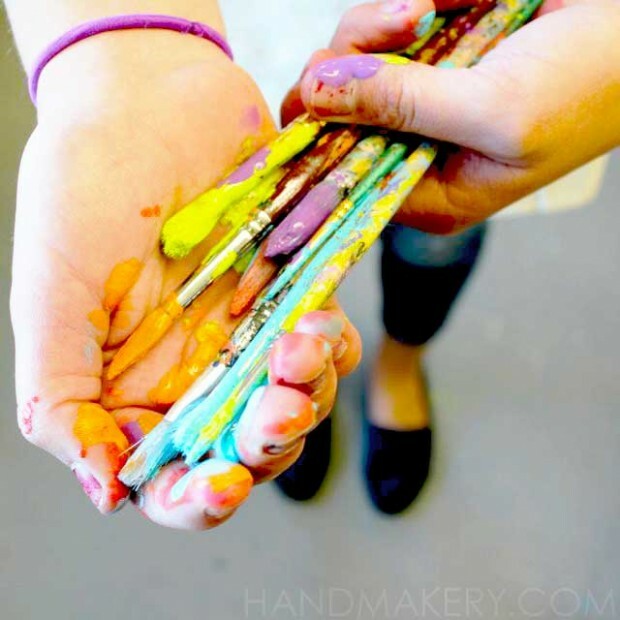 Sometimes I’m a bit jealous of all these kids, I want to learn + paint + create, too! WOW Ami! This is SPECTACULAR. What an accomplishment! Thank you so much Asia for checking out our MURAL IN THE MAKING! So happy you stopped over to visit! Just love being part of the Rockin Art Moms with you!!! Hello Kristina! Thank you for your patience! I so appreciate your comment on our MURAL IN THE MAKING project! Thank you SO much for taking the time to visit http://www.handmakery.com/blog and to take a peek at our projects, especially this one! I think the children really do love seeing their creation as they come into school each day. I think knowing they were part of the entire process of creating, start to finish, really makes them feel proud and accomplished, which I LOVE! I think it is something they’ll always remember and can come visit! We really loved being able to have an unveiling ceremony to really make them feel special as artists! Loved that the local newspaper was able to join us to spread the word into our community! 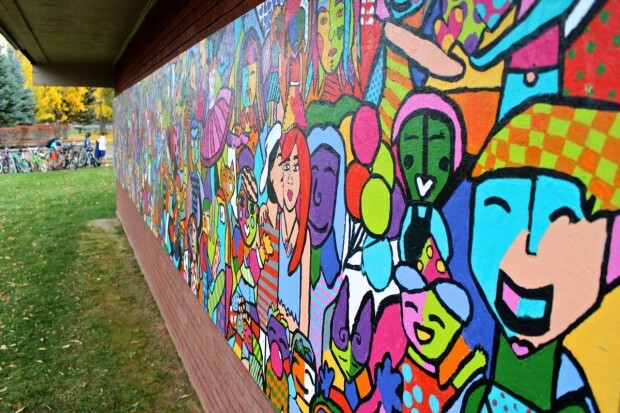 I absolutley love the mural we are thinking of doing something similar for a school group all the way in New Zealand. What did you use for the black outline and black detailing on top of the painted mural?? paint or something like Indian ink/sharpie?? Hello Aroha! Thank you for taking a peek at our mural! How exciting that you’re all the way over in New Zealand! Thank you for your patience with summer vacation! Yes, we used black paint, I believe it was a exterior high gloss but water based for easy clean up to detail the mural. It’s amazing how long lasting this paint is (purchased from a hardware or paint store)! It stands the test of time, especially if the mural is out of the direct sun! Would love for you to tag @handmakery on Instagram with your mural! Look forward to connecting!